Taxonomic concepts of Early–Middle Cenomanian representatives of Schloenbachia Neumayr, 1875 are evaluated based on well-preserved, abundant faunas from NE Iran (Atamir Formation, Koppeh Dagh) and Germany (Essen Greensand and Baddeckenstedt formations at several localities in northern Germany; Meißen Formation of Saxony). From a single Lower Cenomanian horizon in the Atamir Formation, a complete suite of specimens of Schloenbachia varians (J. Sowerby, 1817), ranging from moderately involute, compressed and finely ornamented (“forma subplana”) to more evolute, depressed and strongly spinose forms (“forma ventriosa”) with all transitional morphologies, is documented. Also in the shallow-water faunas of the “Klippenfazies” of the Essen Greensand Formation at Mülheim-Broich and of the Meißen Formation, all morphotypes co-occur. Thus, these forms cannot be regarded as geographic subspecies or successive chrono-subspecies, but reflect a high degree of variability in shell form and ornament (phenotypic plasticity) in S. varians. Interestingly, strongly tuberculate forms are rare to absent in contemporaneous offshore settings as documented by the Baddeckenstedt Formation. The phenotypic plasticity in Early Cenomanian S. varians populations is explained by ecophenotypic variation along a depth (proximal–distal) gradient: strongly tuberculate, depressed forms reflect comparatively shallow, nearshore environments with higher water energy and predation pressure, whereas compressed, weakly ornamented morphs are forms of open (and deeper) marine waters. The complete range of different forms is also observed in micro- and macroconchs, suggesting that the morphological variability is not controlled by sexual dimorphism. Based on its similarity to S. varians, also the Middle Cenomanian Ammonites coupei Brongniart, 1822 may be placed in the synonymy of the former. 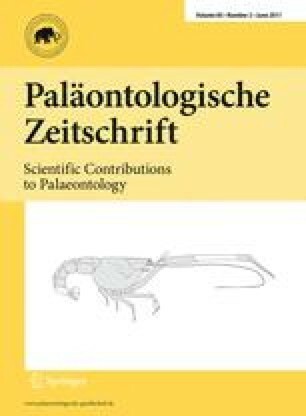 Taxonomische Konzepte früh- bis mittelcenomaner Vertreter von Schloenbachia Neumayr, 1875 werden auf der Basis gut erhaltener, reicher Faunen aus dem NE Iran (Atamir-Formation im Koppeh Dagh) und Deutschland (Essen Grünsand- und Baddeckenstedt Formationen verschiedener Lokalitäten in Norddeutschland, Meißen-Formation in Sachsen) bewertet. Aus einem einzigen Horizont im Untercenoman der Atamir-Formation kann eine vollständige Sequenz von involuten, hochmündigen und schwach ornamentierten Formen (“forma subplana”) hin zu breitmündigen und stark skulpturierten Formen (“forma ventriosa”) von Schloenbachia varians (J. Sowerby, 1817) mit allen morphologischen Übergängen dokumentiert werden. Auch in den Flachwasserabfolgen (“Klippenfazies”) der Essen Grünsand-Formation in Mülheim-Broich und der Meißen Formation kommen alle Morphotypen gemeinsam vor. Diese können daher nicht als geographische oder chronologische Unterarten gedeutet werden, sondern reflektieren eine ausgeprägte Variabilität in Schalenform und Ornament (phänotypische Plastizität) bei S. varians. Interessanterweise fehlen die stark skulpturierten Formen der Art in zeitgenössischen Abfolgen des offenen Schelfs (Baddeckenstedt-Formation). Die Variabilität in früh-cenomanen S. varians-Populationen wird als ökophenotypische Variation infolge von sich ändernden Umweltbedingungen entlang eines Tiefengradienten von proximal nach distal gedeutet: die stark skulpturierten, breitmündigen Vertreter sind Flachwasserformen und reflektieren höhere Wasserenergie und Räuberdrücke, wohingegen die hochmündigen, schwach ornamentierten Vertreter Formen des tieferen Wassers sind. Das Vorhandensein aller möglichen Übergangsformen zwischen den morphologischen Endgliedern, die sowohl in Micro- als auch in Macroconchen beobachtet wird, zeigt weiterhin, dass die Variabilität in Schalenform und Ornament nicht durch Geschlechtsdimorphismus gesteuert wird. Aufgrund der weitgehend übereinstimmenden Morphologie mit S. varians sollte auch Ammonites coupei Brongniart, 1822 aus dem Mittelcenoman in die Synonymie von Sowerby’s Art gestellt werden. We are thankful for constructive reviews by J.W.M. Jagt (Maastricht) and A. Lukeneder (Vienna). Discussions with C.J. Wood (Minehead) and I. Walaszczyk (Warszawa) improved the paper considerably. Financial support for fieldwork in northern Germany to M.W. by the Deutsche Forschungsgemeinschaft (DFG, code WI 1743/3-1) is gratefully acknowledged. A.M. acknowledges a grant of the Iranian government and logistic help by the Payame Noor and Shahid Beheshti Universities. Furthermore, he thanks his thesis supervisors M.R. Chahida (Tehran) and K. Seyed-Emami (Tehran) for support. We also thank U. Scheer (Ruhr-Museum Essen) for access to the material from Mülheim-Broich, H. Schönig (Würzburg) and R. Winkler (Dresden) for their excellent photographic work and N. Richardt (Dresden) for the donation of S. varians from Halle-Ascheloh.